The United States National Anthem is a piece of music that everyone knows and many performers throw their hat in the ring to perform. I perform the National Anthem often, and in my opinion, it is one of the more difficult vocal pieces of music for a singer to perform. The entire range covers an octave and a half, which for most professional singers is doable and expected, however, the vocal line is very punctuated, with leaps of up to an octave and multiple high notes that are to be sung forte and usually marcato (which means with extra emphasis), in order to be true to the lyrics and intent of the piece. By now the fact that Fergie’s rendition was not well-received has hit the headlines. I do not believe there is any value in simply criticizing singers for the sake of criticizing them, when they have put themselves out there and done their best. 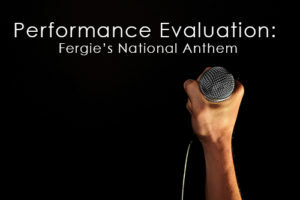 I believe Fergie was trying something new and truly did her best performance under the circumstances. However, I do think there is value in learning from performances and trying to understand the underlying causes for why a performance is well-received, or not. Go ahead and listen to Fergie’s peformance and then I’ll tell you my thoughts, below. It was a jazzy-blues rendition of our beloved anthem. The first reason Fergie’s Anthem stood out, perhaps not for the better, was because she performed it in a jazzy-bluesy style. I am not familiar with the breadth of her work, but I do not think that she is well known for this style. Additionally, the Anthem is not known for being a provactive piece of music in the sensual sense, so these stylings just did not match with the intent of the piece. That said, I will hand it to her, she committed to it and did her best. It would have been easy to bail and just finish up in a more reserved or typical pop style, but she committed and powered through. Her voice was shaking and her pitch was inconsistent. If I did not have the aid of a visual, I would have thought the person performing this anthem was nervous or perhaps recovering from a cold that affected their voice, or vocal fatigue. Fergie’s voice seems to waver and shake, in particular on her held notes. I believe some of this was the result of her attempting a bluesy vibrato, but she does not have the proper control over this technique to make it work and sound deliberate. The result is that it sounds like the wavering is not intentional. This is indicative of a vocal fold vibration that is not consistent, and could be caused by a number of factors: nerves, excess tension, lack of skill, or weakness in the vocal mechanism. She also seemed to over-sing, to push the voice harder in order to compensate for this lack of consistent vibration, which I believe contributed to the pitch inconsistency. Again, I think some of the pitch being flat was due to her attempted style, which if it is new for her, was just not solidified in her voice yet. We felt nervous for her. Despite what those who experience performance anxiety might feel, when a singer is performing, everyone in the audience wants it to go well, for everyone’s sake. If the singer doesn’t do well, it is not just hard for the singer, but it is hard for the audience who may not be sure how to react. We see in the reactions live on screen as well as in the commentary afterwards that her performance was not well-received, and that is because it was really novel and unpredictable. Humans don’t do well with unpredictability, and we tend to react by feeling nervous ourselves, which is what led to some people laughing or smiling. They weren’t sure how to react. As singers, we will not nail every performance. Our audience may not always appreciate our artistic choices, or the quality of our voices. But I believe that the fact that we are the ones on stage, putting ourselves out there, carrying on with the show because once it starts you must complete it, is what counts the most.